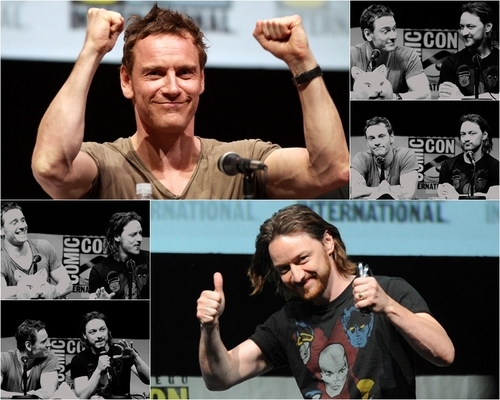 McFassy at Comic Con. . Wallpaper and background images in the James McAvoy and Michael Fassbender club tagged: james mcavoy michael fassbender mcfassy comic con 2013. This James McAvoy and Michael Fassbender fan art contains टेनिस समर्थक, पेशेवर टेनिस खिलाड़ी, and प्रो टेनिस. There might also be टेनिस खिलाडी, टेनिस खिलाड़ी, हस्ताक्षर, पोस्टर, पाठ, चॉकबोर्ड, साइन, साइन इन करें, and संगीत कार्यक्रम.